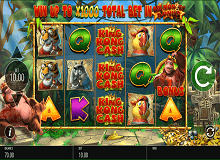 The King Kong Cash casino slot online is a game developed by Blueprint Gaming, one of the well-known casino online developers. The story within the slot is based on the famous character of King Kong who is waiting for you to wake him up. Once you wake up the sleeping ape, you have to persuade him to unlock some cash for you, which is not very easy to do. The whole action takes place in a colorful setting that looks like a jungle you would see in cartoons. There is a huge ape sitting on a throne and he is surrounded by piles of gold and expensive gems. 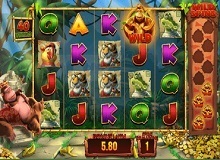 The wealthy ape can be your one-way ticket to riches, as long as you land the right symbols across the reels. Even though the slot is based on the popular films related to the same story, it isn’t as serious as the franchise. In fact, the whole setting is quite silly, as the game features plenty cartoon-like images. When it comes to the graphics, Blueprint Gaming developers have done a stunning job incorporating entertaining 3D animations with this theme. Unfortunately, there is no video introduction to the slot but the game does feature an upbeat sound of bongo drums. 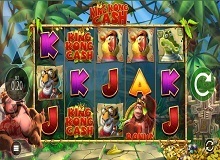 The King Kong Cash casino slot online offers a very simple and basic gameplay. Its 20 paylines are fixed, which means that players cannot reduce the number of paylines when spinning the reels. This makes the betting process quite simple but some players might not like the lack of customization, as they cannot precisely determine their bets. Once you choose the right amount to bet, hit spin or choose the autoplay option to let the slot spin on its own. Even though it doesn’t have any progressive jackpots, this slot machine offers many rewarding features. Some of its bonus rounds can bring you awards of up to 1000 times your initial bet, which is more than enough to keep the high rollers satisfied. Symbols such as the wild and the game’s logo are worth 500 times your bet each, which means there’s plenty of room for you to win larger amounts of money. If you play King Kong Cash for real money, you will be glad to come across the wild symbol, which is represented by the wooden barrel. 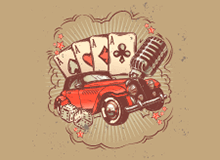 This symbol can substitute other ordinary icons and bring you higher payouts for each combination they appear in. What’s interesting about the King Kong Cash game is the fact that the ape can randomly awake during the gameplay and offer you one of five different multipliers including the Banana Common Wilds, the Golden Barrel Super Spin, the Bonus Boost, the Kong Respin, and the King Kong Streak. The bonus scatter symbol unlocks a ladder bonus round where you get to choose from one of five bonuses. You can also choose to take a risk and move one step up the ladder or collect the bonus you’ve already won. The bonuses you can reach while climbing the ladder include the Barrel Blast bonus, the King Kong trail, the Empire Free Spins, the Golden Kong Free Spins, and the Big Money Bonus. The Big Money Bonus, as its name suggests, is the highest paying of all bonuses in the game, as it is worth 1000 times your initial bet. However, this is the most difficult bonus to reach because it is located at the top of the ladder. It is up to the player to choose whether they want to collect the bonus they win on one step of the ladder or to take one step further and risk losing it all. Besides the Big Money Bonus, the game offers plenty of King Kong Cash free spins, which create even more opportunities for scoring great rewards. Once you start to play King Kong Cash slot machine online, you won’t stop until you wake up the ape and receive one of his generous rewards. Besides waiting for the ape to unlock some cash, the players can gamble on the ladder bonus and have fun deciding their next move. All together, this is one of the most entertaining games designed by Blueprint Gaming, thanks to the wide array of features and bonus games that you can come across while spinning the reels. Keep in mind that each game comes with a risk and it is up to you to decide when it is the right time to take the risky step.